Justices on the U.S. Supreme Court sounded sharply divided during oral arguments in Wisconsin's landmark redistricting case Tuesday, with several warning that what happened in Wisconsin is a harbinger of things to come and others sounding skeptical that a court should ever intervene in cases like these. The divide left Justice Anthony Kennedy in the middle as the perceived swing vote on the court when it comes to redistricting. Aside from a couple of questions about the case's legal standing, Kennedy said relatively little during the arguments. Justices Ruth Bader Ginsburg, Stephen Breyer, Sonia Sotomayor and Elena Kagan — all of whom were nominated by Democratic presidents — sounded willing to strike down Wisconsin's legislative map as a partisan gerrymander, which would be a first in United States history. "They achieved the map that was the most partisan," Sotomayor said of Wisconsin Republicans who redrew Wisconsin's legislative boundaries in 2011. "And it worked." Should the court overturn Wisconsin's map, it would likely result in more competitive district lines being drawn in Wisconsin, giving Democrats a better shot at winning more legislative seats than they have now. Republicans currently hold nearly two-thirds of all legislative seats in Wisconsin even though they received a little more than half of the vote in the last election. During remarks from the bench, Breyer suggested his own four-part test for when redistricting becomes too partisan. "A good example of that is a party that got 48 percent of the vote got a majority of the Legislature," Breyer said, referring to the 2012 election that saw Republicans win 60 out of 99 Assembly seats even though Democrats received more votes. Ginsburg said society should be concerned about what partisan gerrymandering will do to democracy if voters think the outcome of legislative elections are preordained in most districts. "What becomes of the precious right to vote?" Ginsburg asked. Chief Justice John Roberts along with Justices Samuel Alito and Neil Gorsuch — all of whom were nominated by Republican presidents — expressed skepticism that the Supreme Court could intervene in a process that is inherently political. Gorsuch compared the mix of political science metrics that plaintiffs used to measure redistricting to a steak rub where nobody quite knows the recipe. "What's this Court supposed to do, a pinch of this, a pinch of that?" Gorsuch asked. Alito suggested the court needed a clear measure for when a gerrymandered legislative map gets too partisan, a question that has dogged the court for decades. "Gerrymandering is distasteful," Alito said. "But if we are going to impose a standard on courts, it has to be manageable." Roberts suggested the court's reputation would suffer if it was asked to resolve partisan gerrymandering cases all over the country. "We would have to decide in every case whether the Democrats win or the Republicans win," Roberts said. "That is going to cause very serious harm to the status and integrity of this court in the eyes of the country." Justice Clarence Thomas, who was nominated by former President George H.W. Bush, typically does not speak during oral arguments. That was the case Tuesday, although court-watchers believe he's likely to vote in favor of upholding Wisconsin's map given his record in similar cases. Assuming that's how the case plays out, there would be a 4-4 split on the court with Kennedy in the middle tipping the balance. 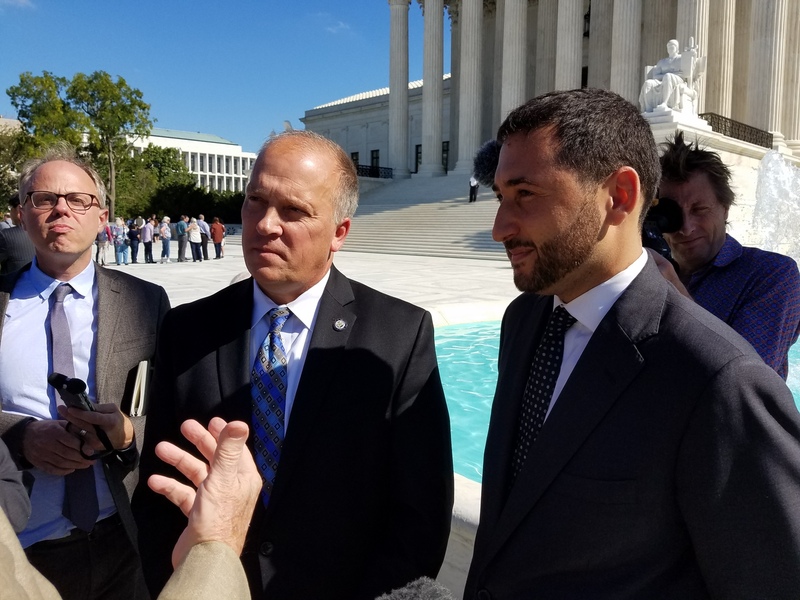 Attorneys for both sides in the case issued dire warnings to justices about what might happen if they overturn Wisconsin's map and what might happen if they don’t. "Plaintiffs are asking the court to launch a redistricting revolution based on their social science metrics," said Wisconsin Department of Justice Solicitor General Misha Tseytlin. "You'll have federal courts engaging in battles of hypothetical experts." Attorney Paul Smith, who represented Democratic plaintiffs in this case, said the real harm would be if the court did nothing, telling justices that the Supreme Court was the only institution that could rein in a process that was damaging American democracy. "In 2020, you're going to have a festival of copycat gerrymandering the likes of which this country has never seen," Smith told the court. "The country is going to lose faith in democracy." People who want to overturn Wisconsin's map rallied outside the court during arguments. That included Arnold Schwarzenegger, who pushed for a nonpartisan redistricting process when he was California's governor. 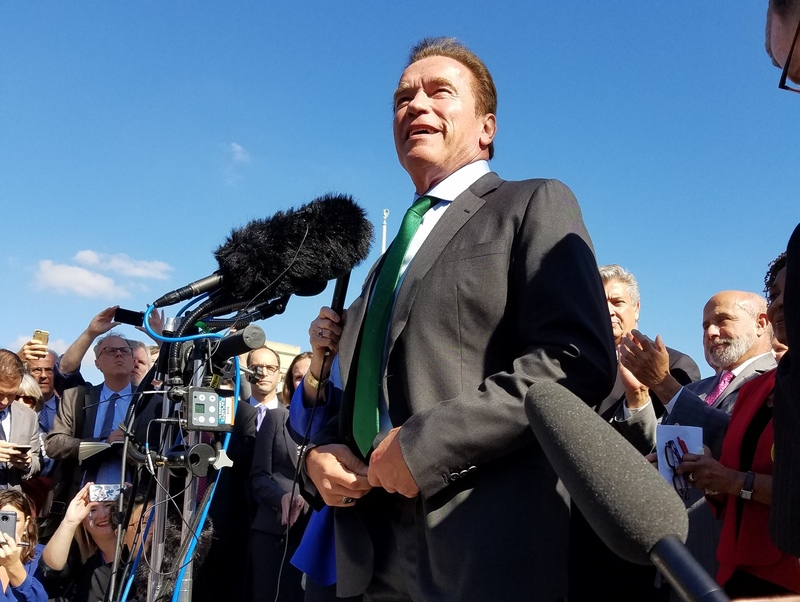 "We are here today to ask the Supreme Court to fix something that the politicians would never do," Schwarzenegger said. Wisconsin Attorney General Brad Schimel, whose Department of Justice is defending Wisconsin's map, told reporters he thought plaintiffs had failed to spell out a clear way to measure partisanship in redistricting cases. Still, Schimel was cautious. "I'm going to be careful about reading the tea leaves too much," Schimel said. William Whitford – a retired University of Wisconsin law professor and the lead plaintiff in the case known as Gill v. Whitford – said he thought Democrats had a good shot at overturning Wisconsin's map. "I would say that I'm confident based on the questions that we've got the votes of Sotomayor, Breyer, Kagan and Ginsburg," Whitford said. "We have a good shot at (Kennedy) and that's been the goal from the beginning." *Editor's note: An earlier version of this story attributed the first quotation to Justice Ruth Bader Ginsburg. It was actually Justice Sonya Sotomayor. Editor's Note: This story was updated on Tuesday, Oct. 3, 2017 at 6:53 p.m.